The majority of food and beverages marketed through multi-million-dollar television and online sports sponsorships are unhealthy, and may be contributing to the escalating obesity epidemic among children and adolescents in the U.S., according to social scientists from the New York University (NYU) School of Medicine and other national academic health institutions. The descriptive study publishes online March 26 in the peer-reviewed journal Pediatrics. Researchers analyzed Nielsen statistics of televised sports programs among children 2-17 years of age. The study found that, among the 10 most watched sports organizations. Most of the food products were rated "unhealthy" under the guidelines of the Nutrient Profile Model, a profiling system that identifies nutritious value in the United Kingdom and Australia. The U.S. does not have a comparable measurement system. Specifically, the NPM system assigns a score to all foods, and scores can be converted to a 0-100 point scale called the Nutrient Profile Index (NPI). An NPI of 64 or higher indicates a food product as "nutritious." When NPI scoring was applied to foods most widely promoted through sports sponsorships, the researchers found that more than three-quarters failed to meet minimal standards for nutrition, with the average NPI score of around 38-39 for promoted foods such as potato chips and sugary cereals. The researchers examined sports sponsorship agreements covering 2006-2016 between food and beverage manufacturers and the 10 sports organizations with the most youth viewers: the National Football League (NFL), Major League Baseball (MLB), the National Hockey League (NHL), the National Basketball Association (NBA), the Fédération Internationale de Football Association (FIFA), the National Collegiate Athletic Association (NCAA), Little League Baseball, and Ultimate Fighting Championship (UFC). 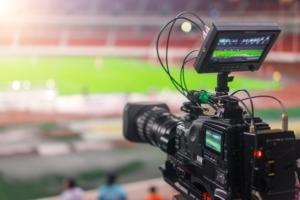 The researchers used Nielsen television ratings for sports programs aired during 2015 to identify the 10 sports organizations whose events were most frequently watched by youth. For each of the top 10, a list was compiled of all sponsors, and sorted into 11 categories, such as "retail", "automotive" and "food/beverage." The "food/beverage" ads were then identified through YouTube and an ad database called AdScope. Researchers used specific search criteria, including name of the product and/or whether a product logo was utilized in the ad. Nielsen audience viewership data indicated that more than 412 million youth ages 2-17 viewed sports programs associated with 10 sports organizations in 2015, and over 234 sponsors were associated with the 500 most-watched programs. Food/nonalcoholic beverage was the second-most common advertising category (almost 19 percent), second only to automotive-related ads (almost 20 percent). Of the 173 instances where food and non-alcoholic beverages were shown, more than 76 percent promoted products with NPM-derived scores of less than 64. The NFL led all organizations with 10 food and beverage sponsors, followed by the NHL with seven. Little League Baseball landed in third, with six sponsorships, which particularly concerned the researchers given its child-targeted nature. Five sports leagues each had four sponsors, MLB, NBA, NCAA, the Professional Golfers Association (PGA), and the National Association for Stock Car Auto Racing (NASCAR). According to the study results, the NFL also led the number of television impressions from its ads among viewers ages 2-17 years old (more than 224 million) and total YouTube views (more than 93 million). "The U.S. is in the throes of a child and adolescent obesity epidemic, and these findings suggest that sports organizations and many of their sponsors are contributing, directly and indirectly, to it," says Marie Bragg, PhD, assistant professor of Population Health at NYU School of Medicine and the study's lead investigator. "Sports organizations need to develop more health-conscious marketing strategies that are aligned with recommendations from national medical associations." This latest descriptive study follows an earlier study, published in 2016 and also led by Bragg and her research team, which found similar results from an analysis of food and beverage sponsorships with top music celebrities. Bragg points out the study's limitations, such as exclusion of in-stadium advertising and sponsorship appearances within games, and an inability to distinguish between unique views versus repeated views of YouTube ads. Still, Bragg asserts, the message is clear. "Unhealthy food and beverage promotion through organized sports is pervasive," she says. "These organizations must put forth a better effort to protect their youngest and most impressionable fans."